Looking for honesty? Tired of hype? You have come to the right place. Everything posted here I have tried or am in the progress of trying. Payment proofs included. Normally I don't like doing reviews until I reach the cash out and have been paid by the website or app. I was bored on April 6th and downloaded it to my phone. I came across it on Facebook in the ads section. Currently the only apps on my phone for making extra cash is GrabPoints, Swagbucks, Caddle, Checkout51 and Mobile Xpression. I am running an older phone (Samsung Galaxy S III) So sadly I am limited with the amount of space I have and then the fact the phone is becoming old in Galaxy series of phones. Once in a while I will download a random "make free money" app as some people call them, get bored of them and do away with the app quickly. I already have been paid once by GrabPoints and am close to another cash out. Gift Game I have only been using for a few days so I still have a ways to go. I am kind of making it quite slow for me though because I am not doing any task like downloading apps for cash. Instead I am playing the games, watching some videos and entering a special key occasionally for coins. 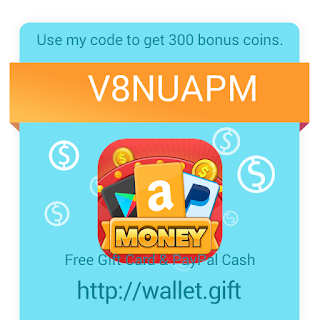 Coins is the currency of the game which then can be turned into Paypal cash or gift cards. 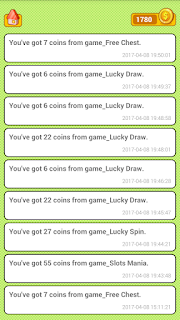 Special – Offers probably are the quickest way to earn coins with this app but some of the offers shown are on other sites I use. For example some offers shown are also on Swagbucks and GrindaBuck and in some cases pay out more. I am not saying the offers are not worth it though, I personally have yet to do the offers section. To be honest I don't like doing offers and leave those for other sites. Free Games – It looks like in the game section you can download these and play them. To be honest I am a tad unclear though. As it does not seem to state how many coins you get for doing this or maybe this is a task that doesn't earn coins. Free Money – In this section there are various apps you can download. Just like the games section though I am left confused in regards as to how this section works and what you earn for installing these apps. Surprise – This is where you can earn by entering the surprise key. You find these on either their Instagram or Facebook account. I checked their Instagram and it looks like they stopped updating it. Their Facebook account though has had a surprise key entered almost daily and they give you up to 12 hours to redeem most of them! This is decent but the coins you earn are random of course. Go here to check the codes daily for extra coins. Down under the big redeem button you can swipe the screen to see various things. I play the 3 games down there. 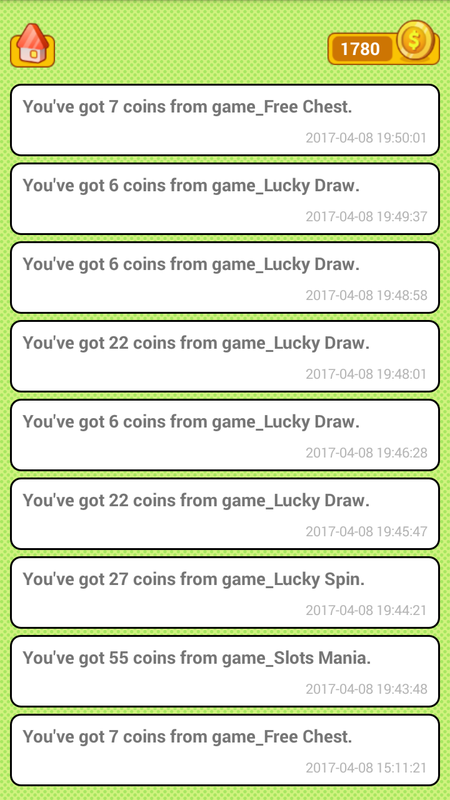 Those games come up as “Fire Finger, Slots Mania and Lucky Spin” One good thing when you first join you get to play these games a total of 5 times in a row. When you open each game you will notice 5 hearts up top, as you play the hearts go away and once you play all 5 times you will have to wait 5+ hours until you can play again. I say 5+ because I was not paying exact attention to how long. The games are free and quite easy to play. In fire finger you just click the button really fast and however many coins you collect is what you get. Slots Mania is just that a slot machine free game and lucky spin is a spinner game. Video Chest – The nice thing about the video chest is even though it appears to take a really long time (mine is showing 5 hours) until I can use it again. It unlocks all 5 videos. These are very short and after each video there is 4 present boxes, pick one and that will be your coin reward. Free Chest – This is similar to video chest only no video to watch just an ad comes up. I am not 100% on this but these free chest appear to be active again almost every hour or so. 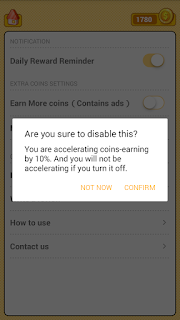 Other ways to earn would be inviting friends and leaving the (Earn more coins: Contains Ads) turned on. This feature works similar to having ads on your phone every time you unlock, they do go away of course but the option is there to turn it off. As seen in the picture above this message shows why I keep mine on. I am not sure why but for some reason they have 2 places where you can see your coin earnings. 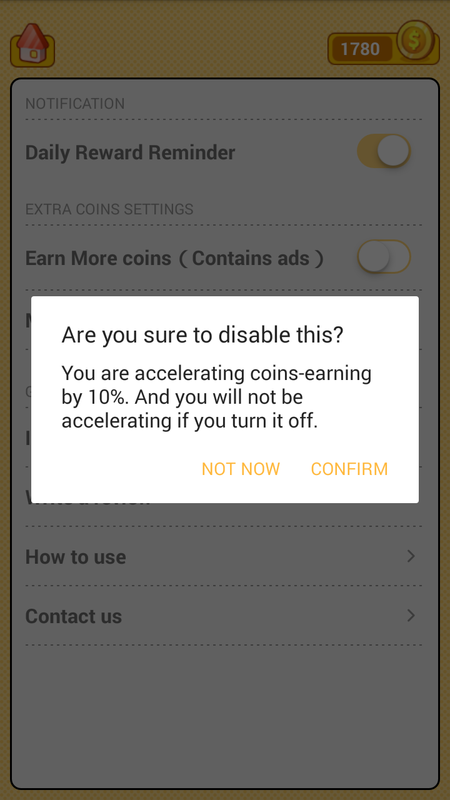 The first picture shows something that says “Accelerate” this is the payment for the ads on the lock screen, which I assume only credits when you unlock and are looking at them. The next picture of the earnings does not show Accelerate earnings but seems to show in maybe a more clear way where other earnings come from, I also find this 2nd area easier to read over the first one for understanding sake. One reason why I lost interest in phone earning apps is because I find them slow. However it still is another way to earn so I try to look at it that way. When going into the “Redeem” button there is a drop down menu where you can select your country. The countries right now are listed as: United States, Canada, France, Germany, Switzerland, Italy, Hong Kong, Japan, United Kingdom and India. I am in Canada so I can choose between Paypal, Amazon.ca, Google Play and Itunes. I much prefer getting Paypal but the lowest redeem is $1.00 CAD which will cost me 6,000 coins and 13,000 for $3.00 CAD. I find that odd that they charge 1,000 more for redeeming $3.00. People in the USA have more gift options such as Paypal, Amazon, Google Play, Itunes, Steam Wallet, Playstation Network and Xbox Live. And for some reason their Paypal $1.00 amount starts at 7,500 coins. I am not going to go through every country because the amounts and gift cards appear to be different per country and in different amounts. If interested feel free to be my referral because if you are, you will get 300 coins to start off your account. If you have used this app feel free to leave comments on your feelings about it. I am still on the fence with it myself. Feel free to ask questions and share the post too. You will notice I changed my blog theme and there is a share option on the side now. Happy earnings! I have been asked this before when I was promoting Prolific Academic because I love the site so much and it is not really a survey site so much. Well it is and isn't, some surveys may want you to write out responses to questions, some are click and choose task and so on. They are quite interesting compared to a boring beverage survey for example. The biggest thing seems to be demographics and some people seem to think it is country based which sometimes is true but not always. I was taking a look into their FAQ page and found this "Please note that many studies have eligibility criteria. This means that sometimes only certain demographics are required (e.g. 20-30 year old female Astrophysics students from Germany, to give one example). - Take from Prolific Academics http://support.prolific.ac/article/51-who-can-participate-in-studies-on-prolific-academic "
April has been a busy month for me. I started my work at home job and today marks exactly a month of working for them. The job is work from home which is awesome but because of that my online earnings probably won't have a chance to go up by much. I guess it will depend on my free time. I also have 2 checks to add to my balance and one of them is from Caddle which is awesome. I also downloaded an app called "Mobizen" to my phone and have made a video using the app "Streetbees" and "Caddle" from my phone. I will upload those to Youtube sometime within the following weeks. Appen - $14.00 AUD - $13.20 conversion to CAD. Streetbees - $1.60 USD - $1.98 conversion to CAD. GrindaBuck - $1.00 USD - $1.24 conversion to CAD. Caddle - $21.25 CAD Feel free to add my referral code: LEEANN99859 when you complete your first offer we both get $1 bonus! February was a busy month for me so my earnings were not great but for 2018 this is my best month so far. January I made $53.12 and this month a total of $90.65 after conversions. I am happy with that amount because it has been a while since I made close to $100.00 online within a month. My earnings could have been much better of course but it did not work out that way. February seemed to be a lot of family time. Me and my boyfriend had a nice turkey dinner with my parents and had a couple dinners with his. Valentine's day doesn't matter to me much but we did go on a double date with his mom and dad to a nice little spot. I am 30 years old and live in Nova Scotia Canada. I have been researching ways to make extra cash online for a long time. On this blog I will share that with everyone and also share payment proofs too. Is working at home popular? why isn't my blog making money?